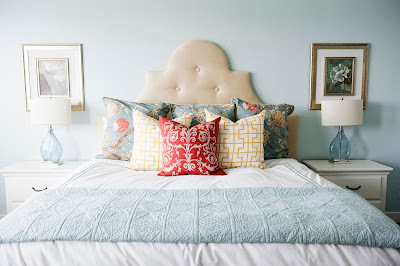 Here are two beds from this week in blog land that I can't get out of my head. 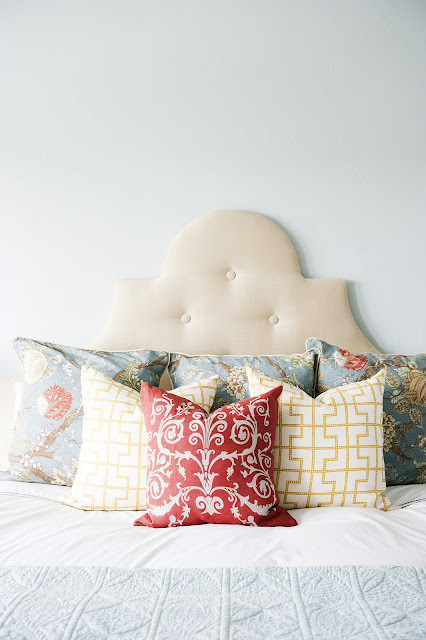 That gorgeous headboard was a DIY project. Isn't it stunning? You can see and read more of this beautiful bedroom and entire house here. I'm excited to be coordinating my bedding over time. Yesterday I picked up two pillowcases at GW that I'm sure will look great with the rest of the things I've collected. I also found this linen skirt at GW that I want to make into a pillow too.That's the story with all my bedding--I've gotten it over time at different stores/yard sales, etc. (You can read about my sa-weet Ralph Lauren coverlet find here.) And I just found these pillows on Etsy that I'm slightly obsessed with that would look great with my bedding too. Oh all the options out there! Okay, I'm off to the thrift store to pick up something that I spotted yesterday. Ooh...can't wait to show you guys! Well have a great holiday weekend. See you back here on Tuesday. That 1st bed is pretty awesome. Can't wait to see what you are going to pick up. I am sure you bought it for like 61 cents! ahh! That second bed is stunning! Will you be trying a diy soon? ?